I see variations of this claim fairly regularly when I’m reading about the neverending discussions about evolution and religious creationism. I sympathize. People want certainty, and science is not always great at providing it in the short term. Give a lot of scientists 50 years or more, and we can often provide pretty good confidence, approaching certainty. While “science changes, but the Bible doesn’t” is mainly appealing to emotion, I’ve actually always appreciated the “Things mean what they say” aspect of Biblical literalism as an intellectual position. It’s honest. Give me an outspoken young Earth creationist over a hand-waving, insincere “intelligent design” proponent any day. I obviously disagree with the the whole “inerrant” part of Biblical literalism, not to mention the absolute refusal of Biblical literalists to update positions in light of new evidence. Still. Sticking to your guns on interpretation of text? I respect that. But the next times someone pulls out “You can’t trust that ever-changing science,” I have a new riposte. Because this particular branch of Christianity is now providing an object lesson in the fact that while the text of the Bible may not change, its interpretation sure does. And this is exactly what’s going on in some Protestant churches in the US now. Diana Butler Bass, an American church historian and scholar who focuses on the history of the American church... said, white evangelicals are motivated by a willingness to read the Bible non-literally when it comes to passages about, say, caring for the poor. The context of this article is about political policy, not science, but nevertheless... if your position is that the Bible literally means what it says, you have to apply that to the whole text. 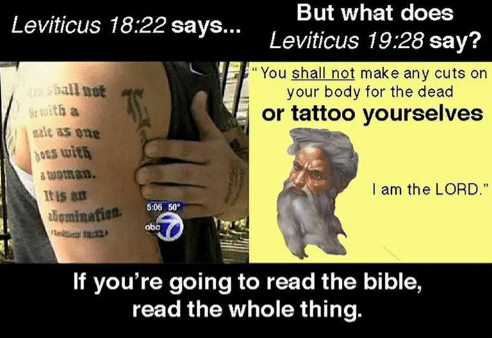 You can’t say the story of Genesis takes place in seven days of 24 hours length and then say the whole prohibition against tattoos (say) is just a big misunderstanding. While I can respect the intellectual honesty of Biblical literalism, it’s hard to respect people who extol it without practicing it.